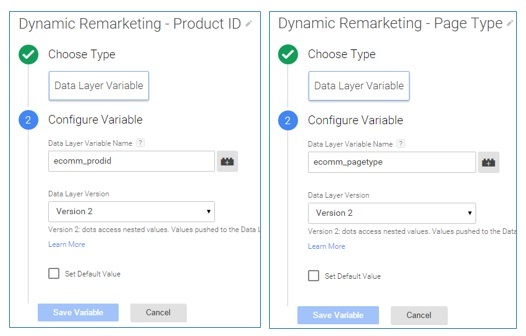 In this article you will learn to set up dynamic remarketing in Google Analytics and Google Adwords via Google Tag Manager. 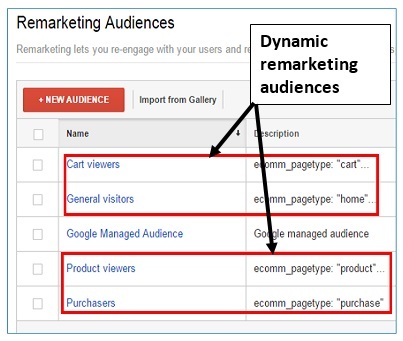 This article is in conjunction with the article: Guide to Dynamic remarketing in Google analytics & Adwords where I introduced the concept of dynamic remarketing and how it can be implemented without using Google Tag Manager. I would suggest you to read this article first (if you have not already) to get the most out of the current article. I won’t be explaining the very basics of dynamic remarketing in the present article. The whole process of setting up Dynamic remarketing is quite complicated. It is probably the second most difficult tracking implementation in GA. The number one is, of course, enhanced ecommerce tracking setup. There is no one switch available which I can show you, that you can just turn on, and boom dynamic remarketing is all setup and ready to go. You can retarget the people: who abandoned the checkout, who abandoned the basket and/or who abandoned any other shopping activity. You can retarget repeat customers, new customers or prospects. Among repeat customers, you can individually re-target high value and low value repeat customers. Likewise among new customers, you can individually re-target high value and low value new customers. In fact in the article 100+ Google Analytics Remarketing audiences for Retargeting, I outlined more than 100 different ways to remarket to your target audience. Identifying remarketing audience is important as dynamic remarketing setup varies from audience to audience. So before you set up dynamic remarketing (which is basically a dynamic version of remarketing), you need to clearly define your most important remarketing audiences. Identify the industry vertical (like travel, finance,education etc) that best describe the products/services you offer. Identifying industry vertical is important as dynamic remarketing setup varies from industry to industry. Once you have identified your industry vertical, you then need to identify your industry attributes. For example, if you work in the retail industry then the attributes for your industry (in the context of Dynamic Remarketing) would be: product ID, product category page, product detail page, product price etc. Similarly, if you work in the Real estate industry then the attributes for your industry (in the context of Dynamic Remarketing) would be: listing ID, listing page type etc. 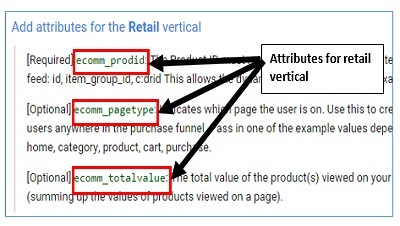 Here, ecomm_prodid, ecomm_pagetype and ecomm_totalvalue are attributes of the products viewed on your ecommerce website. ecomm_prodid – represents product id. You can send more than one product ID to Google Analytics. ecomm_totalvalue – represents value of the viewed product(s). The list of verticals and the list of attributes listed in the Google documentation are just examples. 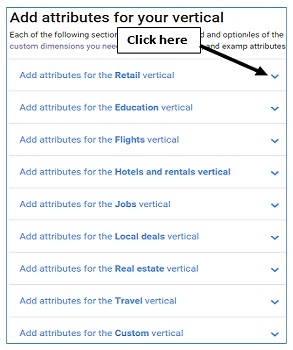 You can implement dynamic remarketing for any type of business or industry vertical, whether or not the industry vertical is listed in the Google documentation. Likewise you can use attributes for your industry vertical in addition to the one listed in the Google documentation. 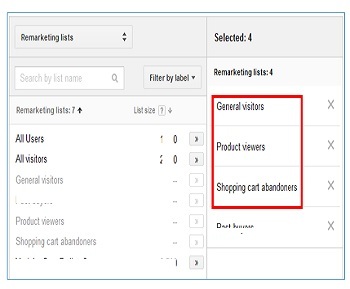 #2 Non-Standard remarketing attributes which are additional attributes you want to pass to Google Analytics like: loggedIn_users, members, nonMembers, highValue_customers etc. The number and type of attributes that you use will depend upon your re-marketing audience and website navigation structure. Note: I have written this article under the assumption that your industry is retail. I picked up this industry as it is one of the most common industry vertical. But my article is equally valid for any other industry. Identify all the web pages and web page elements to which you are going to add the data layer code for dynamic remarketing. Note: home page, product category pages and search result pages are not a good candidate for dynamic remarketing as you can’t do precise retargeting with dynamic remarketing ads. Identifying all the web pages and web page elements in advanced for dynamic remarketing will help you in understanding the scope of the work. 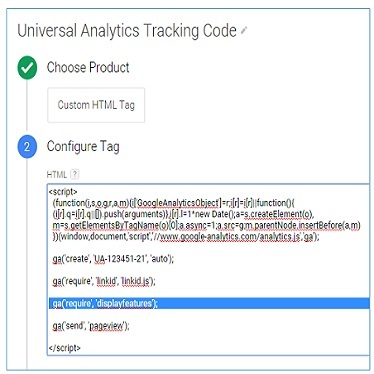 Login to your Google Tag Manager account and edit the tag you used to deploy Google Analytics tracking code on your website. 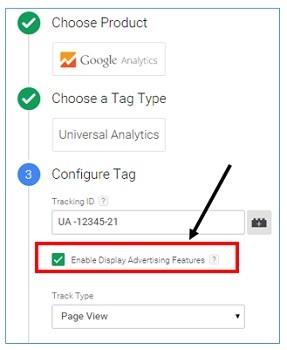 This step is required to enable remarketing and advertising reporting features in Google Analytics. 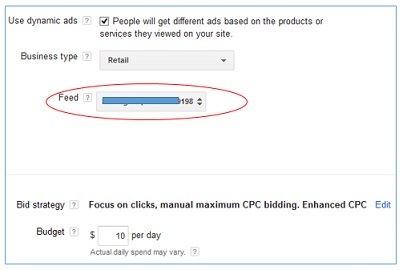 Linking your Google Analytics account to your Google Adwords account is pretty straightforward. Check out this article: https://support.google.com/analytics/answer/1033961 if you are not sure. 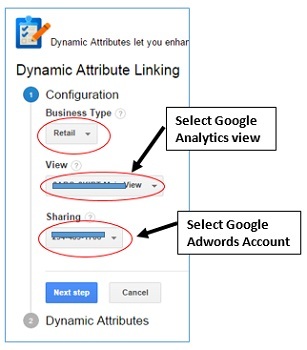 It is important that you link the two accounts, so that later you can use dynamic remarketing audiences of Google Analytics in Google Adwords. 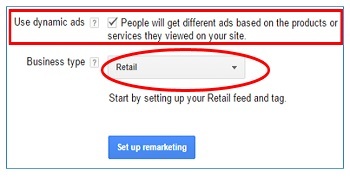 Google use Product data feed from your Merchant account to create dynamic remarketing ads. So it is critical that you have got a Google Merchant Center account with live product data feed. Product data feed is a text or XML file which stores all of the information about your products. Without Google Merchant Center account and live product data feed, you can’t set up and run dynamic remarketing. #1 Create your product feed according to feed specifications and Google Shopping Policies. This integration is required so that Google Adwords can use product data feed from Merchant account to create dynamic ads. In dynamic remarketing we retarget users with ads of the product(s) they viewed on your website. Now in order to accomplish this task, we need to capture attributes (like product ID, product price) of viewed products from your website. Therefore we are going to use data layers to capture attributes of viewed products. Depending upon the size of your website and level of customization your CMS offer (through templates), you may have to create and hardcode lot of data layers to your web pages and web page elements for dynamic remarketing setup. 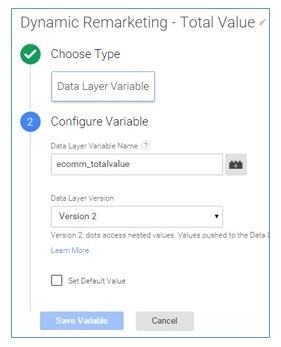 Make sure that you add this data layer immediately above the GTM container code. [product_id], [page_type] and [product_price] are server variables which retrieves product id, page type and product price from a page. The page can be a product detail page, shopping cart page, checkout page and/or one of the funnel step pages. In case you need to capture attributes for multiple viewed products, use an array. [<product_id1>,<product_id2>] is an array of the ids of the products added to the shopping cart. <product_id1>,<product_id2>, <page_type> and <total_value> are all server variables. The server variable <total_value> retrieves the total value of the products added to the shopping cart. In order to pull attributes of viewed products from data layers, you need to create one data layer variable for each attribute of a viewed product you want to capture. 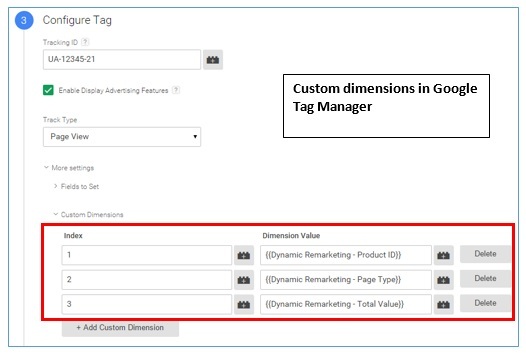 In order to send attributes of viewed products from Google Tag Manager to Google Analytics, you need to create one custom dimension for each attribute of a viewed product you want to capture. 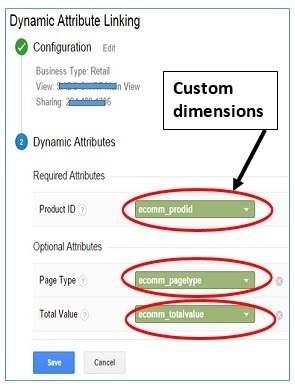 For example, if you are capturing the 3 standard attributes (ecomm_prodid, ecomm_pagetype and ecomm_totalvalue) of viewed products then you need to create 3 custom dimensions. #1 Create custom dimensions in your Google Analytics property. Now, login to your Google Tag Manager account and edit the tag you used to deploy Google Analytics tracking code on your website. 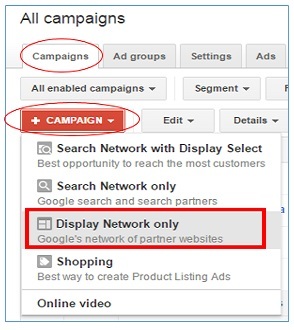 You need to create dynamic remarketing audiences in Google Analytics so that later you can use them while creating dynamic remarketing campaigns in Google Adwords. 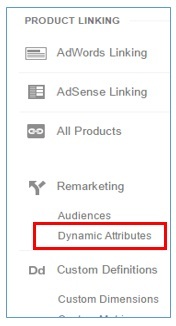 You need to create Dynamic Attributes in Google Analytics in order to send the attributes of viewed product to Google Adwords. Create one dynamic attribute for each attribute of viewed product you want to capture. 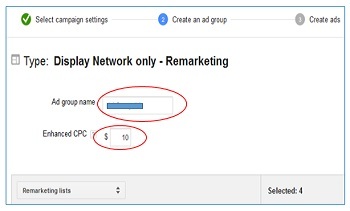 Step-6: Create your ad template and then run your dynamic remarketing campaign in Google Adwords. 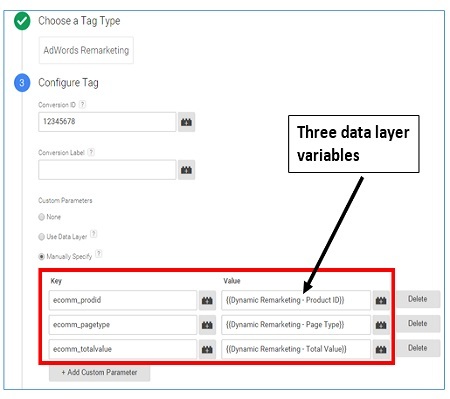 That’s how you can set up dynamic remarketing in Google Analytics and Google Adwords via Google Tag Manager. 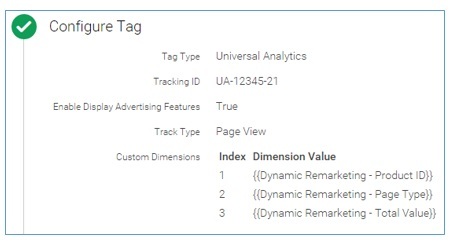 In Google documentation on setting up dynamic remarketing via GTM, you will see Google Adwords remarketing tag being used. 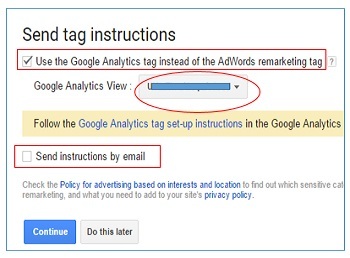 Though this method is easier to implement, I did not use this method because I use dynamic remarketing audiences from Google Analytics for creating Dynamic Remarketing campaigns in Google Adwords as they are based on the GA data. Also in this way, I can reuse dynamic remarketing audiences for other purpose.